Hi everyone! Are you getting in the Halloween spirit? 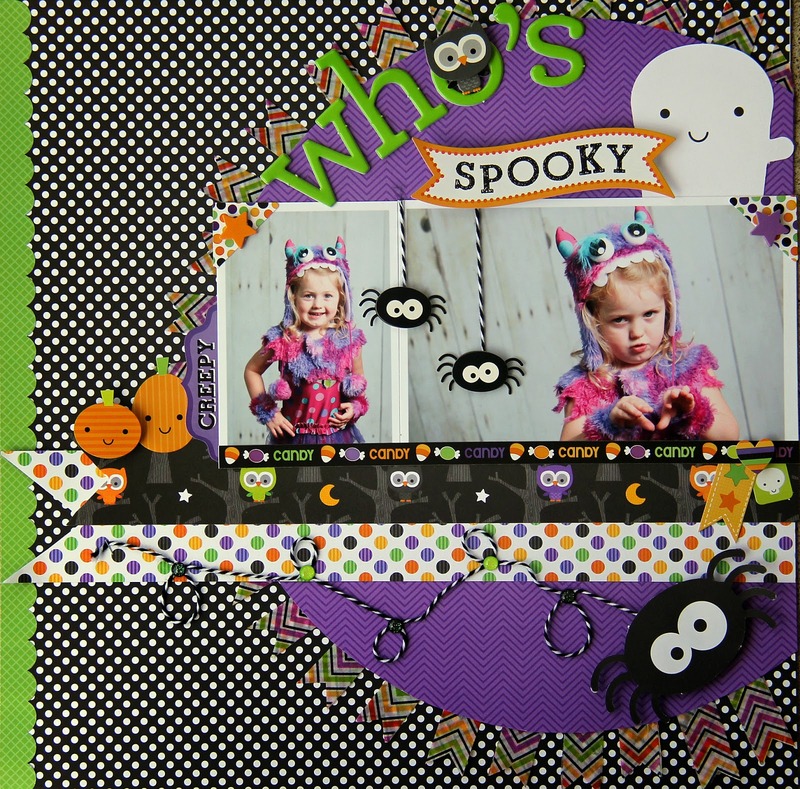 Jodi here today to share with a layout I created using the new collection Ghouls & Goodies! I simply love Halloween, and every year I try to get pictures taken of my kids in their costumes ahead of time, to ensure I get some awesome photos before Halloween night! 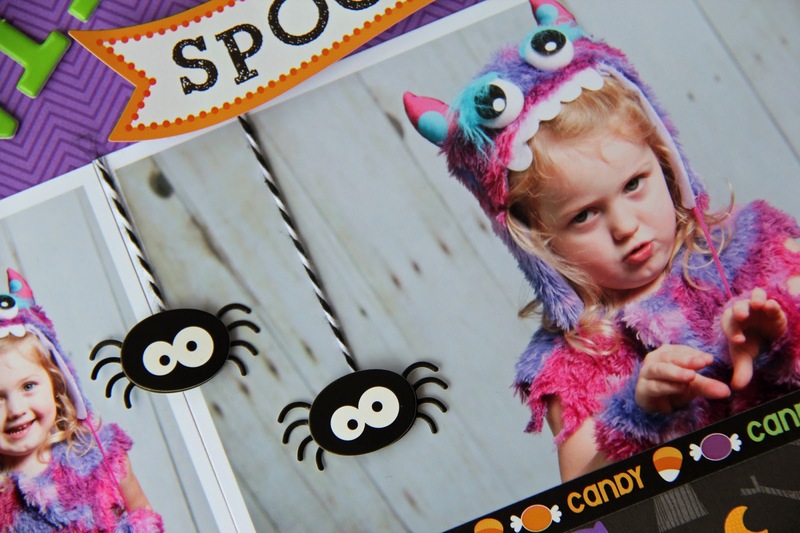 Today I am sharing a layout I did my youngest in her little monster costume. I started the layout by creating a large circle and off setting just to the left side of the background page. I added some washi tape cut down to little banners (I thought his gave the purple circle some added flair!). I then add two more strips of paper near the center. I hope you are getting lots of spooky ideas for this upcoming Halloween!! Thanks for letting me share today! Adorable Jodi! I LOVE the spiders in this collection. Oh, and I also had to share with my Facebook friends because the ghost is so cute! I also love how the little spiders are coming down onto the pictures! I love this layout! that colors and the details are so fun! Also the pictures are asorable! Perfect cobination! Pinned it of course! The cute little stickers are my favorite! I pinned this adorable layout. What a sweet little monster!! And and equally adorable layout to go along with her!!! :) Super cuteness!! Very cute love all the colors of Halloween. What a super cute layout! I love all of the embellishments and layering. Love the layout, the papers are gorgeous and I love the washi border! The die cuts are so fun and I love the use of the twine for the spider web! LOVE your photos and layout!!! Your twine dangling spiders are SO COOL and your washi-framed circle FABULOUS - LOVE IT ALL!!! I love your layout!!! So very cute! Such a well done layout!! 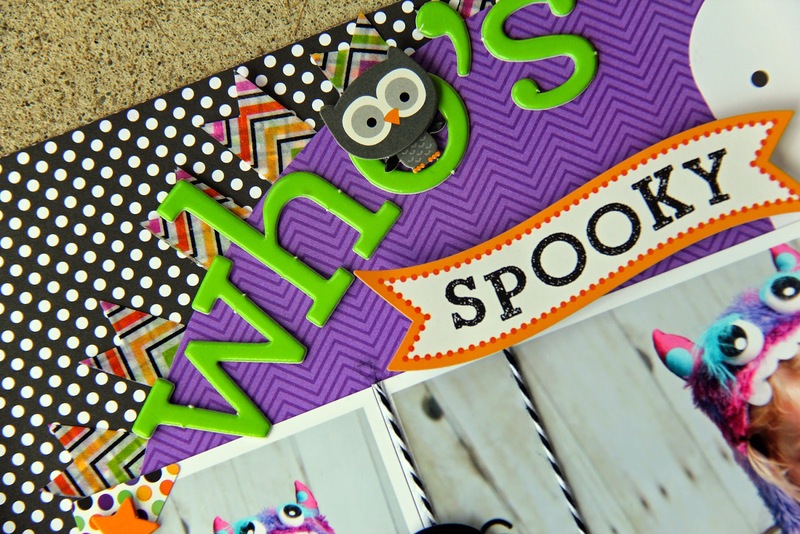 Love the owl peeking through the O and so many super clever ways to use the newest Doodlebug cuteness!!! So awesome! !